When I thought about what we wanted on the new Growler, a bulletproof fuel system was at the top of the list. I&apos;ve been on lots of boats over the years and many of them seemed to tiptoe on the precipice of engine problems caused by fuel issues: water in the fuel, leaks that allow air into the system, rust or junk accumulated on the bottom of a tank or contamination of various kinds that threaten the reliability of the main engine or engines. Let&apos;s clear the air about the facts of cruising under power. More than 90 percent of all diesel engine problems are fuel related. Period. Cooling circuit problems are a distant second. It shouldn&apos;t take a mechanic to see that carefree cruising is intimately tied to a fuel delivery system that can provide clean fuel no matter what the perfect storm. To digress a moment, the fallacy of get-home systems and the reliability argument for twin engines is somewhat amusing to me, as both suffer from the assumption that a catastrophic engine failure will ruin the day, caused by some internal disintegration of the main diesel engine. When the main diesel blows up, simply fire up the get home to make it safely to port. It&apos;s an unrealistic illusion. The reality is that they are the same thing, a boat with twin engines and a single engine boat with a wing engine. Trust me, fuel problems will kill either of these alleged insurance solutions. Not to generalize too much, but given a choice, I probably would prefer smaller twin engines over a large single with a wing engine because the twins will be run and maintained regularly. And if I was going to have twin engines anyway, why not get some obvious maneuvering benefits? Every catastrophic diesel failure I&apos;ve heard about over the years involved a new engine in a new boat. During an engine&apos;s initial hours of operation a faulty part will make itself known. The reality is that if a new diesel engine makes it past 100 hours and is properly maintained, it is very unlikely to become a weapon of mass destruction. So many builders have shared this experience that you should feel comfortable with an engine after this initial period of adolescent uncertainty. When Laurene and I discussed the construction details of our new cruising boat, I opted to stay with the benefits of a single engine and do everything we could to address issues surrounding its reliability. We asked the builder to make it a priority to address all single points of failure throughout the entire fuel system. Using the money saved by not purchasing a second engine, we designed and installed the best fuel management system that would fit in a 36-foot lobster boat hull. One might argue, given the 315-gallon fuel capacity of Growler, that we turn fuel over fast enough (at 16-knot cruise) not to need such an elaborate approach to fuel systems. That is true in terms of fuel storage. However, a sister ship took on a load of bad fuel a couple of years ago and the cost to clean up the mess was more expensive than the onboard fuel system we installed to avoid that predicament. Which would you prefer? No matter what type of cruising you do, when leaving home waters, there is always risk-whether your boat carries 1,500 gallons of diesel or only 150. Bad fuel is bad fuel, and none of us is immune. 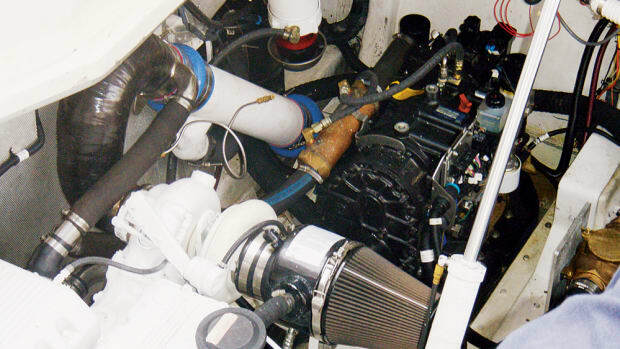 The marine version of the John Deere PowerTech 8.1L 6081 comes with its own fuel/water separator and fuel filter, both mounted on the side of the engine block. The fuel filter element is rated at two microns, meaning that it is the last stand of protection for fuel going into the injectors feeding the diesel. These two filters are certainly good solutions for protecting the engine from water in the fuel or contamination, but each is a single point of failure. If either one is overcome, the entire fuel delivery system is out of commission. To avoid this, Zimmerman Marine installed additional fuel filtration between these filters and the fuel tanks. It is my hope that the engine-mounted filters never will receive contamination in any quantity to cause an engine shutdown. Zimmerman Marine installed dual Racor 900 filter units, redundant filters that separate water from the fuel as well as filter the fuel as it passes through on its way to the engine. (Steve D&apos;Antonio, Zimmerman VP, Ops and a PMM contributing editor, told me he would have liked the larger 1000 models, but there was no space for the tall monsters.) Each Racor unit is a stand-alone filter, yet the two are mounted on a manifold that allows me to switch to either filter while under way. Any clogging problem, therefore, is dealt with easily by the turn of a valve handle, diverting fuel from one filter to the other. This gives me time to change the element in the affected filter. A second Murphy gauge (FW Murphy makes gauges for all sorts of agricultural, marine and industrial applications and is found on many commercial workboats) is located at the helm, so I can monitor the fuel vacuum while running the boat. This gauge provides instant awareness of my fuel filter situation and is clearly marked to show when the vacuum rises enough to warrant switching to the other filter. Growler has two fuel tanks: the port tank carries 165 gallons while the other holds somewhat less, for a total of 315 gallons. The tanks are not connected directly, although the builder suggests that it is normal for this kind of boat to draw from both tanks at the same time to maintain vessel trim. Growler is a tad faster than traditional trawlers and weight is an issue. Each tank has a fuel sump, or well, at its lowest point to collect any water or dirt that comes aboard or accumulates in the tank. The fuel pickup for each tank is mounted on the top of the tank, rather than gravity fed from an outlet near the lowest point. The builder feels strongly that drawing fuel from the top is a decided advantage over gravity fed systems, as it negates the possibility of leaks. With a pick up tube extending to within 1.5 inches of the bottom of each tank, it is even more unlikely that particulates and water at the bottom of the tank will enter the fuel system circuit to the engine. Of course, as in every boat, there are valves to draw or shut off fuel from either or both tanks. This fuel delivery system should prove very reliable and give me confidence that Growler will not be stopped by fuel gremlins without a fight. But we did not stop there. Up to this point we had addressed only how to improve the fuel delivery system. We also needed to improve how we maintain the fuel and tanks. To put together a system of the highest quality, we chose an ESI Clean Fuel System, and I&apos;m very excited about this system addition, having listened to ESI&apos;s Alex Marcus at TrawlerPort for several years. A total fuel maintenance system, the components of the ESI system are designed to maintain fuel whether it is being used or not. The company has some huge clients that make our little boat systems very tiny indeed, such as AOL&apos;s backup generation plants, and the gensets that power the U.S. Army&apos;s satellite downlink program. The fuel system designed for Growler includes a separator/filter, high capacity fuel pump, antimicrobial protection and timer. It is not just a bunch of parts, but one slick piece of engineering. Space constraints made a standard ESI board unworkable, so the components are spread on the starboard side of the aft cockpit. Zimmerman added some fancy doors to cover the installation. The purpose of the onboard fuel-maintenance system is two-fold. The obvious purpose is to be a cleaning machine for the fuel in the boat, drawing diesel from each tank and feeding it through a quality filter before returning it at high pressure to the same tank, separating out water and filtering all particulate matter. The filter contains a 10-micron element. By running this system on a regular basis, I should never reach a point where the dual Racors of the fuel delivery system (which can be fitted with either 2-, 10- or 30-micron elements) receive unclean fuel. It is great insurance for clean running engine performance. But the secret weapon of the ESI system is the engineering that goes into sizing the pump and fuel lines. The high pressure pump chosen for this installation is rated at 180 gallons per hour, which means it will swirl the fuel at high flow rate through the boat&apos;s fuel system with powerful force, agitating all settled material at the bottom of the tanks and elsewhere, creating a colloidal suspension in the fuel that will then pass on through the large filter in the ESI system. Planning between ESI and Zimmerman Marine resulted in a fuel system installation where hoses and fittings are sized to optimize the benefits of this feature. In essence, the ESI system cleans the fuel and then uses the clean fuel to clean the tanks, swirling up any sludge or debris: construction debris, bad fuel, microbial growth, rust or aging material that is slowly breaking down. This second benefit is my insurance policy that I will have a clean fuel system over time rather than just clean fuel in the tanks at any given moment. This alone justifies the price of the system, as age takes its toll on boats and people. Every owner of an older trawler knows the rust, sludge and asphalt compounds that accumulate at the bottom of a tank, waiting for that Gulf Stream or Tehuantepec crossing to clog a filter at the most inopportune time. ESI designed our fuel maintenance system so that it would turn over the fuel 1.5 times in each tank for maximum cleaning of that tank and its elements. On Growler this translates to about an hour and a half per tank, an interval determined by a tank&apos;s capacity. I promise to be religious with this system, as it is my fervent wish to never become stranded with a dead engine. And given Zimmerman&apos;s creative installation in the aft cockpit, I can sit back, feet up on the coaming, enjoying an evening martini in a quiet anchorage, while polishing my precious diesel fuel for the next day&apos;s run. At this writing, we leave for the Bahamas Pokie Run in a month, so I&apos;m getting up to speed with how all this works. But I can honestly say that the combined efforts of Steve Zimmerman, Steve D&apos;Antonio and Alex Marcus (chief engineer at ESI) created the most bulletproof fuel system I could have in this boat. And it was much less costly than a second engine or get-home system. I&apos;ll report back on our experience as we begin to cruise the boat around the world.